The exciting follow-up to Brothers in Arms. Miles Vorkosigan is in trouble. His brother, a cloned stranger formed from tissue stolen from Miles when he was a child, wants to murder and replace him. Unfortunately, Mark has learned that without Miles, he is... nothing. This was the book that proved beyond all reasonable doubt that I'm putty in Lois McMaster Bujold's hands. At regular intervals she had me exclaiming out loud "no, no, NO! ", and telling myself she'd gone too far, and that I wasn't going to follow where she was leading, but every single time, I did. I totally did. And I loved it, more than any of her books up to now. I'll back up a little bit. Right, plot. You might have noticed that the description above is particularly cryptic and uninformative. To be honest, it was a bit of a job to find anything suitable at all. I'm starting to sound like a broken record now, but spoilers can be a real problem with this series. The blurb on goodreads, for instance, is a bit of a blow-by-blow description of most of the plot! I'll try to do better. Be warned, though, that below are spoilers of the previous book. 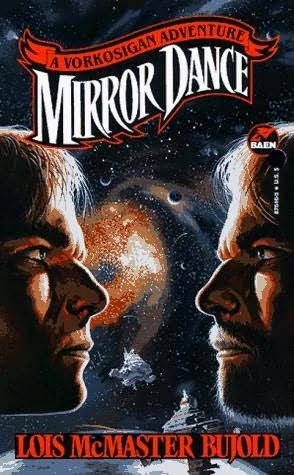 Mirror Dance starts with Mark, Miles' twin brother (as Miles sees it)/clone (as Mark does), implementing his plan to assume Miles' identity to free a big group of clones from the same House in Jackson's Hole that created him. The clones are destined for a cruel fate: they have been commissioned by aging powerful people who intend to have their brains transplanted into the bodies that are a younger version of themselves. The brains of the clones simply get dumped. Mark intends to save them from this fate they simply don't know is coming. And right away, I was blown away by Bujold's deftness at psychological characterisation. Mark tells himself he's being heroic, but it's just as clear to the reader that what's mostly driving him is the desire to prove himself to his hyper-successful sibling. Anyway, things go wrong, very, very wrong. And Mark finds himself in a situation where he really must prove himself. Example #1 of the many times when Bujold took me kicking and screaming in a direction I didn't want to go came a little while after the botched rescue operation, when it had become clear that Mark was going to be a principal POV character in the novel. Initially I was basically "hmm, ok...", but then came a scene when I felt his behaviour had put him completely beyond the pale (it involves a big-boobed rescued clone who looks quite grown up but whom Mark knows is actually really a child). There was absolutely NO WAY I was going to root for that vile little prick. I absolutely, definitely wasn't, and I really resented having to spend any time in his POV. Right until I started caring about him quite passionately and desperately interrogating my friends who've already read the rest of the series about whether Mark was a POV character in any future books. Because this book is really about Mark coming into his own. Oh, there is a fair bit of Miles as well (and I really enjoyed that, too), but for Miles Mirror Dance mainly sets up the conflict in the next book, the wonderful Memory. This one is about Mark, about him coming to terms with his origins and his history and his family and really, mainly with himself and who he really is. It's funny and exciting and an absolutely gut-wrenching and heartbreaking book, because Mark's journey and his struggle to build his shattered identity isn't easy. But it's definitely worth sticking it out. Some of my favourite sections take place in Barrayar and concern the relationship between Mark and his parents (merely biological parents when they first meet, closer to real parents after a while). We get quite a bit about Cordelia and Aral and see how they’re doing as a couple and parents, which was nice in its own right. I particularly enjoyed Cordelia’s open-eyed, completely unidealised view of Miles (and Mark), which reminded me very much of Elizabeth Peters’ Amelia Peabody and her expert management of Ramses. The more I read of this series the more amazed I am at Bujold's talent and psychological acuity, and the more I kick myself for not picking this up sooner. Well, I don't know, maybe I needed to grow up a bit before I appreciated this properly. I must say, though, in the spirit of trigger warning, that some sections are very tough to read. This might be spoilerish, but you probably do need to know before you start that there is some really, really upsetting and awful torture, both violent and sexual, and it happens to a character we really care about. It’s not narrated in real time, but what we’re told is pretty graphic. It really upset me, and it was yet another section that made me furiously angry at Bujold as I was reading it. Having finished the book I see why she wrote it the way she did, and I agree it was necessary for the book to work as well as it did. Also, I think my acceptance stems from this character ending the book in a good place, with a hopeful outlook for his life, getting the help he needs. Someday I will have to reread this series. About 15 years ago, I picked up Komarr, then immediately had to go back to the beginning and read the entire series. But I sped through them so quickly that I think I would enjoy seeing them again. They really were something special. Ah~ You've arrived at the golden arc of the series. I'm envious! It was a 4-5 star phase for me from The Borders of Infinity to the end of the series minus Cryoburn, which I wish someone told me to read it before Captain Vorpatril's so that I didn't finish the series with that feeling. Marianne: Oh, yes, much as I loved this, it will be a tough one to reread. And I know just what you mean about Memory. Lots of talking out loud to Miles in those sections. I will post my review soon! Then give yourself a proper break from the series - it's not that A Diplomatic Immunity isn't okay, but I think it suffers by comparison with the 'golden arc' - great description - of the previous books. Then (and you can space these out sensibly) Cryoburn - because even though Ivan's book is set earlier, there aren't any spoilers in Cryoburn for CVA, and Cryoburn is a main course sort of book, where CVA's more of a sherry trifle, and you should finish with the dessert. Marianne: Yes, please, I really appreciate the suggestions! I think I might just do that. I've already loaded A Civil Campaign on my mp3 player, so it'll be easy to just keep going (and, if what I suspect from what I've read so far in Komarr is right, I will really, really not want to stop). And you think I should read Cryoburn, then? People have been very good not to spoil anything, but the hints sound pretty dire. If Bujold's going to kill characters I love (I fear for Aral and Cordelia! ), I'd rather not read it and pretend it didn't happen! I've a weird problem with Cryoburn. I have to read a book several times before I know what I think of it, and I just haven't been able to reread this one. (I've just checked: it's currently bookmarked at page 7.) I usually get 50 pages in, then find I've accidentally started reading something else. I've even tried - cunning, me - getting past my mental block by simply starting at page 50, but that stratagem failed. So while I enjoyed the book first time through, I don't have a useful opinion to offer as to whether it's a great, good or average read. Pretending the book doesn't exist is always an option. However, I'm not sorry I read it. For some reason I can’t do audiobooks. I simply fall asleep. But if that ever changes, I will remember these are good. Also, might get them for my husband. I can’t bring myself to read Ivan’s book. Yet. I too much enjoyed the fanfic, Twenty-Year Man by Ellen Fremedon (and I almost never read fanfic), which has become AU now. Oh, just in case someone is curious, Twenty-Year Man should be read after A Civil Campaign. I think it's a hard book to read not so much because of THAT scene or even the torture scenes, but because of that tight POV from someone who essentially despises himself for much of the running time. And you basically live that journey with him from sheer disgust at this "vile little prick" to profound amazement and pride at what he's able to accomplish. In some ways, I think Mark is one of the strongest characters in the saga - he may not dazzle in the way that Miles does, but he finds that he can endure and do things that Miles would never have been able to. And because of that, like Cordelia, I think Mark sees Miles much more clearly than Miles can see him, or even himself! Hmmm - you did ask me earlier about CRYOBURN. I personally liked it more than CAPTAIN VORPATRIL'S ALLIANCE which I just found rather dull. I would probably read it last simply due to the chronology and the fact that it really does wrap up the saga. But yes, get some distance after A CIVIL CAMPAIGN as the last books of the saga are good by most standards but not by the standard of the "golden arc"! Marianne/Jorrie: I've never read fanfic before but you are tempting me. Any other recs? And where can I find them - just by googling or is there a special site? You can download as epub/mobi/html/pdf. It’s a nicely restrained m/m romance with lots of UST and lots of plotty stuff. Ivan-focussed. I’m sure Bujold has lots of fanfic, but I’m actually not usually drawn to fanfic, despite loving this one! Chiming in for a couple of reasons. First, to second the rec for A Deeper Season. And also to recommend Two Descants on Deformity, a short fic in which Miles plays Richard III. I'd never thought of the two works together, but in retrospect it seems brilliant. Second, to say that I quite liked Cryoburn, with the caveat that when I read it (it was published before Captain Vorpatril's Alliance), I thought it was the end of the series, which influenced my view of it. Also, I haven't checked out LMB's website in a while, but I think in an interview from around that time (sorry, I can't find a link) she had talked about what she saw as Miles's lifespan, which put the entire series arc in perspective for me. Third, I agree that CVA is a sort of dessert. As much as I enjoyed getting Ivan's POV, it didn't read as *necessary* to the series to me or as really advancing it thematically. Also, I've never read fanfic, but I think this might be the series that will push me into it. I've noted down all your recommendations, so many thanks! I'll shut up after this, but I'm going to add that I love Captain Vorpatril's Alliance. Partly it's a reaction to reading romance - a lot of authors change a character when it's their turn to become the hero: they're more heroic than they were as the sidekick, and have unexpected hidden depths. So I love that Ivan is still just Ivan. And I admire Bujold's skill in writing an adventure for a hero who is reactive rather than proactive. I did find it an odd book to read first time through - because Miles is so well established in my imagination that I almost 'heard' an acerbic running commentary from him on Ivan's life choices as I read. I've now reread it several times: it's a firm favourite of mine. @CD - there's a lot of Vorkosigan fanfic at archiveofourown - A Deeper Season is the only one I've really read. I think jmc recommended it to me originally. "I admire Bujold's skill in writing an adventure for a hero who is reactive rather than proactive." That is definitely true but I think that was part of the problem for me - I find Ivan works better as a foil than a protagonist. However, that might have been me "hearing" Miles' acerbic commentary throughout as well! However, there are parts of CVA that I loved - particularly the "Alliance" itself and the ending. Have you heard that Bujold has announced a new Vorkosiverse book? My understanding is that it's focused on Cordelia, set 3 years after Cryoburn, and titled Gentleman Jole and the Red Queen. Due out in early 2016. Whoop! otterb: Yes! I did see the announcement on goodreads, but I've been avoiding finding out more for fear of spoilers. Fantastic news! Shame it's such a long way off, but I guess that guarantees I'll be all caught up with the series by then.